A 2-day workshop with 4 hours of classes for All Levels and 3 extra hours for Intermediate/Advanced dancers. It will be fun and challenging for all! A Social Dancing Night will also take place on Saturday 24th in Adelphi (52 Middle Abbey Street, Dublin 1) this means you can practice your newly learned moves directly on the dance floor while dancing to the tunes of our DJs! Blues FUNdamentals. Time to get down and figure out the basic techniques which underpin your blues dancing. Learn how to alternate rhythms and mix up your connections to create a variable dance straight away, and don’t forget the fun! Use your whole body! Leading and following make so much more sense when we connect with each other through our entire bodies, it even becomes possible to dance together without touching! All the ochos! Blues has taken some of the coolest things from various dances and ochos are amongst the best. Find out how you can use stretch and compression to create interesting asymmetrical shapes while keeping that blues feeling. Playing with dynamics. Want to turn a good blues move into a great one? Time to introduce some dynamics. This class will teach you how to create and control speed changes and contrast during your dancing. The magic close embrace. Learn how to become one with your partner and effortlessly travel across the dancefloor. Then step it up to integrate triple steps, rotations, flicks and lunges into your close embrace repertoire. Technique of fancy and flashy moves! Who doesn’t love a flashy move? When they go right it looks incredible and feels even better. You will put all of your blues skills together in this class to pull off moves which make your friends go “oooooooooooo”. * Schedule subject to confirmation. Note: One year of regular blues dance classes are required to attend the Intermediate/Advanced classes. School teacher by day and dance teacher by night, Nick Shirbini finally summoned the courage to go blues dancing in 2013 and quickly transformed from a nervous beginner to a community leader. Ilaria Parisi grew up in Italy with a background in artistic gymnastics, modern dance and hip-hop from the age of 6, she moved to London in 2012 and started soon after her blues dancing journey. Outstanding contributors of the London blues scene, front and centre of the Swing Patrol's very own blues troupe The Down & Outs, Nick & Ilaria travelled all across Europe to constantly learn, perform and compete, with many wins under their belts. 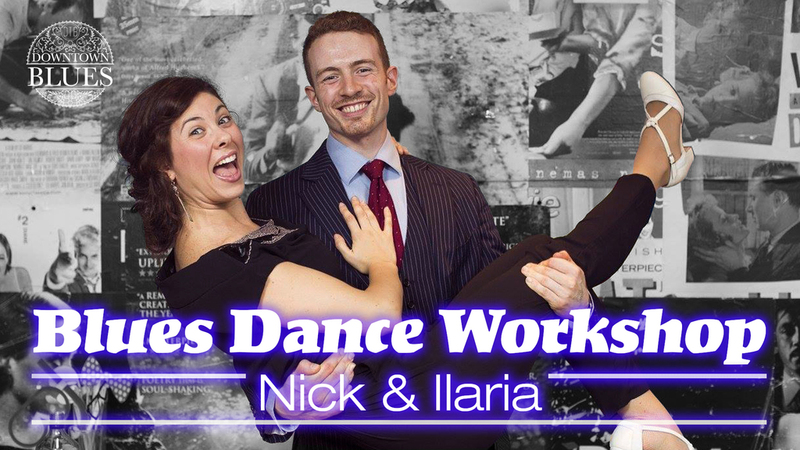 Regularly mentored by the illustrious Adamo & Vicci, Nick & Ilaria began their teaching journey in 2014 for the special occasion of Milan’s first blues dancing workshop. Since then, they have successfully run and taught at Sin City Blues, the Tuesday blues night in central London - they have also been part of teaching teams at international festivals such as Bluesila, Drag the Blues Barcelona and Double Shot Valencia. "We cannot wait to visiting Dublin for the first time and spread our passion for the beautiful expression of life, love and music that blues dancing is!"